More than a year ago, 80-year old Helen Douglass described her shoulder and forearm pain following a stroke as nine out of 10. 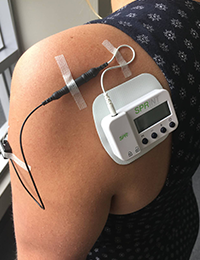 Last summer the Cleveland-area resident participated in a clinical trial for SPRINT, a small wearable stimulator patch and has no pain now. Her story is one of many SPR Therapeutics points to and the Ohio company is now marketing the FDA approved portable device that delivers neuro-stimulation to the nerve causing the pain. CEO Maria Bennett says SPRINT is somewhere between TENS and a fully implantable stimulation device. Some medical scientists believe the patch could become a substitute for opioid abuse. Bennett says, "Part of the wire is placed in the body in proximity to that target nerve that’s causing the pain while the remaining part of the wire exits the body and is connected to an external stimulator that provides stimulation from the wire to the nerve." This patch uses electrical stimulation to the nerve causing the pain. SPR says patients only have to wear SPRINT for two months and the pain disappears for months or years. Dr. John Chae, Medical Director of Neuro-musculoskeletal Service at MetroHealth System, says the patch works best for stroke patients, people with shoulder, lower back, phantom amputation pain and pain following a total knee replacement. "Individuals who had the pain for less then eighteen months had the best response." He believes the reason the pain goes away after patients wear the patch for two months is it is able to reverse changes in the spinal cord and brain after the constant bombardment of pain sensations. Chae and others believe this technology can replace opioid use. Even Ohio politicians are talking about it. The patch may eventually be tested for pain relief in other areas of the body.